Texas Gov. Rick Perry. Photo from AP. See "Yo, America. It’s Texas. We’ve got another one for ya!" by James Moore, Below. Appearing on television Thursday, Texas Governor Rick Perry, a potential contender for the Republican nomination in 2012, said that he wants states to be able to opt-out of Social Security. On CNN's Parker/Spitzer, hosted by Democrat and former New York governor Eliot Spitzer and political columnist Kathleen Parker, Perry compared Social Security to a ponzi scheme and said that Americans want Washington to stop spending so much money. "Here's what I think would be a very wise thing," he began. "In 1981, Matagorda, Brazoria, and Galveston Counties all opted out of the Social Security program for their employees. 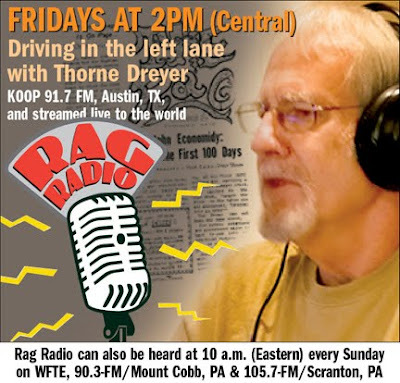 Today, their program is very, very well-funded and there is no question about whether it’s going to be funded in the out years. It’s there. That’s an option out there." "So, you want to let people opt out?" responded Spitzer. 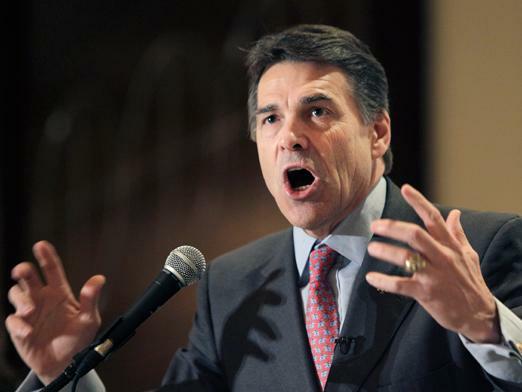 "I think, let the states decide if that’s what's best for their cities," Perry replied. "They should," the recently reelected Texas governor said. In his forthcoming book, Fed Up! : Our Fight to Save America from Washington, Perry is highly critical of federal government policies. Though not on sale until November 15th, excerpts were recently leaked to reporters. In the book, Perry criticizes government programs such as Social Security, Medicare, Medicaid, and unemployment insurance, but seems to exempt America's largest expenditures on defense, national security, and foreign military aid. Instead, Perry attacks social welfare programs as "fraudulent systems designed to take in a lot of money at the front and pay out none in the end." "This unsustainable fiscal insanity is the true legacy of Social Security and the New Deal," he wrote. The book is also critical of the the 17th Amendment, which established the election of senators by popular vote instead of by state legislatures. Though posturing himself as a small-government conservative, Perry was behind a scheme to implement a "market-based approach" to the state's highway congestion by dividing Texas into corridors split by massive toll roads financed by foreign investors. Land would have been seized by eminent domain and tolls would have been collected for 50-plus years. While the so-called "Trans-Texas Corridor" has been effectively scrapped, critics of the plan say it is still largely in play but renamed and broken into dozens of smaller projects. Perry was also criticized by Republicans for ordering every school-age girl in the state to receive an injection of the Guardasil vaccine, meant to protect against cervical cancer. His executive order, which the GOP-dominated legislature blocked, came after drug maker Merck doubled lobbying efforts in the state. At the time of Perry's reelection, Texas was running an estimated budget deficit of up to $17 billion, according to the state comptroller's office. Asked directly if he plans on seeking the presidency, Perry did not offer a concrete answer. A national survey conducted by the GfK Roper consulting firm found that 90 percent of those ages 18 to 29 considered Social Security "important" and nearly 80 percent of those over 65 considered it "one of the very most important government programs." In addition, 80 percent of respondents said contributing to Social Security benefited "the common good." RAW STORY editor Stephen C. Webster contributed to this report. ...Perry should learn a little history before he raises up the 1981 experiment as a model for Social Security reform. In that experiment, three Texas counties “decided to opt out of Social Security and instead to provide their public employees with a system of privatized accounts.” But this system left participants worse off than they would have been under Social Security. Moreover, Perry’s proposal closely resembles Alaska GOP Senate candidate Joe “A Noun, a Verb and Unconstitutional” Miller’s economically impossible plan for a state takeover of Social Security and Medicare. A workable plan to allow states to opt out of Social Security would require draconian provisions, such as a mandate that everyone must retire in the same state that they worked and paid taxes in. Otherwise, workers who are too young to receive Social Security benefits would move to an opt-out state to avoid paying Social Security taxes -- and then promptly move to a state with Social Security benefits the moment they became eligible. Eventually, the entire system would collapse under the weight of too many Social Security beneficiaries who had not paid into the system. Dream team? Rick Perry and Sarah Palin during Perry campaign rally February 7, 2010, in Cypress, Texas. Photo by Dave Einsel / Getty Images. We’ve got another one for ya! There are many people hoping the GOP chooses Sarah Palin to run against President Obama and we can finally get a definitive answer to this nagging question of national self-immolation. I do not believe we will be able to make that choice. The electorate tends to dance with radicals and buy them drinks but generally lets them go home alone to have more scary dreams. Well, here is another frightening notion to all y’all from your friends down here in Texas: President Rick Perry. Coyote-killer Rick, however, was taking credit for the state’s geography and climate, which have been essential to job and business growth. Regardless of what the governor argues, no one is coming here as a result of his or his party’s policies. Property taxes are the worst in the country and the schools that are funded with that money are overwhelmingly mediocre, which has led to a scandalous charter school program. Roads are falling apart, state parks are suffering decaying infrastructure, our air is the dirtiest in the country, mass transit is resisted by leadership, and we are ranked 48th or 49th in every government consideration other than raising up unqualified presidential candidates. Perry might be a little light in his Lucchese’s but he has shown a great facility for ignoring standards and even the law without enduring penalty. On the same day his reelection filled the column inches and the web site of the Austin paper, there was also a report that the governor was refusing to release a copy of a $4.5 million contract with the state. The money went to a startup technology company founded by one of Perry’s major donors. The American Statesman filed a Freedom of Information request but Perry’s office said no and ignored the fact that those millions are tax dollars and the manner in which they are spent is subject to public disclosure. How money is used and where it comes from makes the kid from Paint Rock a bit nervous, unless, of course, he is the beneficiary. He has become inexplicably wealthy during his term while earning less than $200,000 annually. Conversely, he has turned down hundreds of millions in education dollars from the federal government that would have provided improvements to Texas schools because he claimed there were “strings attached.” There were: good grades. 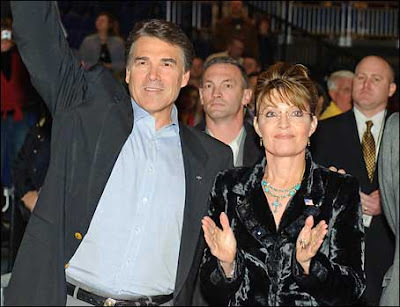 The red run of Election Day does more good for Perry’s opaque ambition than it does Sarah Palin’s. As he brags about having the best job in America, the governor begins a national tour for his slim book about being fed up with the feds. Answers to softball questions will saturate the airwaves from friendly media over the next few weeks and there will be talk of his Texas mandate and it how it compares to the whopping win George W. Bush earned in his race against former Texas Land Commissioner Garry Mauro. The pretext to begin circulating Perry’s name for a presidential run will be easily established and the Tea Partiers that he energized with his irresponsible talk of secession will slowly turn pragmatic and confront the question of who can win in 2012. Palin may not have been the personality who sent those Tea Partiers to the polls but she loves them and they have affection for her. That attraction, however, cannot be consummated because there will never be enough Tea Partiers to elect a president. A compromise is inevitable since the GOP cannot field an electable candidate without energizing the party’s Diaspora, which has tipped way right. What’s a bad speller to do? Palin will do well in several early primary states and if the GOP wants to have any chance against President Obama it will have to engineer a ticket. No matter what either party suggests, American presidential politics is more about viscera than intellect and issues. Uncertain voters tend to make decisions based upon charisma and aesthetics. Few people trust political ads and when they are busy trying to pay down credit card debt or keep the mortgage banker at bay they do not have time to read party platforms or study issues on candidate web pages. Party activists are the only people paying attention to campaigns until the last few weeks. Which leads us back to Rick Perry. The GOP is already spending time trying to find a prospect to get Sarah to act a bit more politically demure. Their options are limited. Haley Barbour, the well-wired governor of Mississippi (State motto: Thank god for Texas) has the round face and weary drawl of an old school southern pol. As connected as he is to governors’ mansions and DC insiders, he would have a tough task against Obama if for no other reason than aesthetics. Jeb Bush will not be able to help himself and will pursue the White House because he wants to prove he is the “smart one” in his family but there are no more than two dozen voters that want to see another Bush or Clinton on a national ticket. New York Mayor Michael Bloomberg will likely enter the picture as an independent and burn enough money to make E-Bay’s big bucks Meg Whitman look fiscally prudent but he will not travel well in the south; except for Florida. The compromise ticket will be Perry and Palin. They will make a lovely camera-ready couple from the union’s two biggest states. (The Hair Pair?) Team Tea Party has fondness for both of them and the mainstream party machine can convince donors that Sarah will never get her hands on the nuclear launch codes but that she is necessary to elect the ticket. The only complication is Karl Rove’s role. He is still ginning up cash and running a big fund-raising operation and he has offended Palin and the Tea Party. Karl, who does not seem to be able to keep friends, led Perry’s campaign when he won his first statewide office in Texas but there has been an alienation of affection. Rove supported Sen. Kay Hutchison in her race for governor against Perry in the Republican primary. Karl will need to be taught to heel but that should not be a problem since he has proven in the past that victory and money are more important than any principle. So, there you go, America; since you are too busy to get informed we will just turn this into American Idol or maybe Dancing with the Stars. Nothing to read. Just use your cell phone or your remote to vote. Have fun!!! And we will go ahead and start grooming you another goofball down here in Texas.